Thirty home runs used to mean something. It still should. Luke Scott has never truly received the appreciation he deserves during his time in Baltimore, in part because his feast-or-famine routine at the plate leaves him starved for hits for extended stretches. As full seasons go, 2010 has been Scott’s most impressive effort over the long haul as he continues adding to a career-high home run total that currently rests at 26. 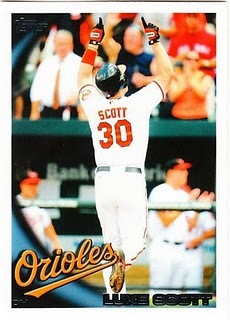 Hitting 30 would move him into some elite Orioles company and hopefully earn him some acknowledgment. Baseball’s steroids era inflated home run expectations among fans. At this time in 1998 Mark McGwire was busy burying Roger Maris’ single-season home run record and in the process making 30 homers appear pedestrian. Consider, though, that only 14 players in O’s history have hit 30 or more home runs in a season, led by Eddie Murray who did it five times. Gus Triandos was the first Oriole to pass the 30 homer mark. He did so in 1958. The ’60s brought a relative power surge to Baltimore as the O’s had batters with 30 or more home runs in six different seasons. Meanwhile, Jim Gentile and Frank Robinson became the franchises’ first 40 home run hitters. Gentile whacked 46 in 1961, Robinson 49 in 1966. The 1990s Orioles matched that effort with 30 home runs in six different seasons, topped by Brady Anderson’s 50 in 1996 and Palmeiro’s 43 in 1998. On the flip side, Boog Powell and Ken Singleton were the only Orioles to break the 30-homer mark in the ’70s. Powell (1970) and Singleton (1979) each totaled 35 home runs in a season. Baltimore has never had fewer 30 home run seasons in a full decade. This entry was posted in Orioles history and tagged Albert Belle, Aubrey Huff, Boog Powell, Brady Anderson, Cal Ripken, Eddie Murray, Frank Robinson, Gus Triandos, Jim Gentile, Ken Singleton, Larry Sheets, Luke Scott, Miguel Tejada, Rafael Palmeiro, Tony Batista. Bookmark the permalink.